Naturally, I am instantly inclined to want to do all of them differently, however, this does mean that my 2000 Point army objective has… grown somewhat! 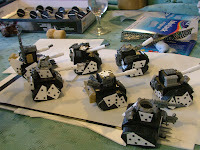 So a Big Thanks to LukoDakka, as without the assistance of his Airbrush I would have been knackered! 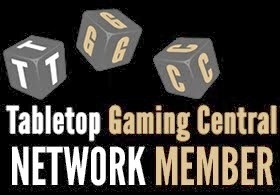 Well, the fact that I currently have a permanent game table set up on my Dining room and the fact that I’ve wanted to keep myself busy has meant that I have pretty much *NAILED* my 40k Non-Tournament objectives already! Against an always Tough opponent I was already about 150 points down in this game (due to campaign rules we are running) so it was going to be tough, but I thought I’d have a realistic chance at survival with the possibility of a sneaky win. Not-A-Chance. The Big Kahuna played a clever game, setting up as far away as possible and tailoring his list (only slightly) with lots of Big and little bug shooting. Getting into combat was hardly fun either as his army wide preferred enemy can be a big deciding factor! A Campaign Game against LukoDakka, and one of those rare, fabulous games where the result is always in doubt and never certain right up until the end. Danté is still a beast and I yet again failed to nail him, that said I was very pleased with the performance of a lot of my bugs in this game, sadly with the exception of the Mawloc, who looks like he has such great potential on paper, but has let me down this month a little. Don’t get me wrong, he is great, and if he burrows underneath something (especially with the amount of Hits I’ve been getting recently!) 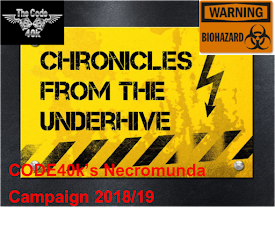 he can cause some serious damage, HOWEVER, I believe he may suffer from ‘Vindicator Syndrome’ Great on paper, but if you take one, take multiple copies as one doesn’t necessarily cut the mustard. A Sly and accomplished Archon who had an extra 250 points on me… it was sheer Butchery. I got stomped flat claiming only 3 Kill points in the entire game as I was mercilessly gunned down and outmanoeuvred. Yes, Yes, I am a sucker for punishment! This game was closer than the previous 2 against Dark Eldar, and resulted ultimately in me running out of Troops in order to claim or contest an objective. I could possibly have still snuck a draw as the Mawloc had gone under on turn 5, but alas, there was no turn 6! Still a good game and against an opponent I don’t play against with particular frequency! Ahh…. My first game against Doc’s mindless Horde! 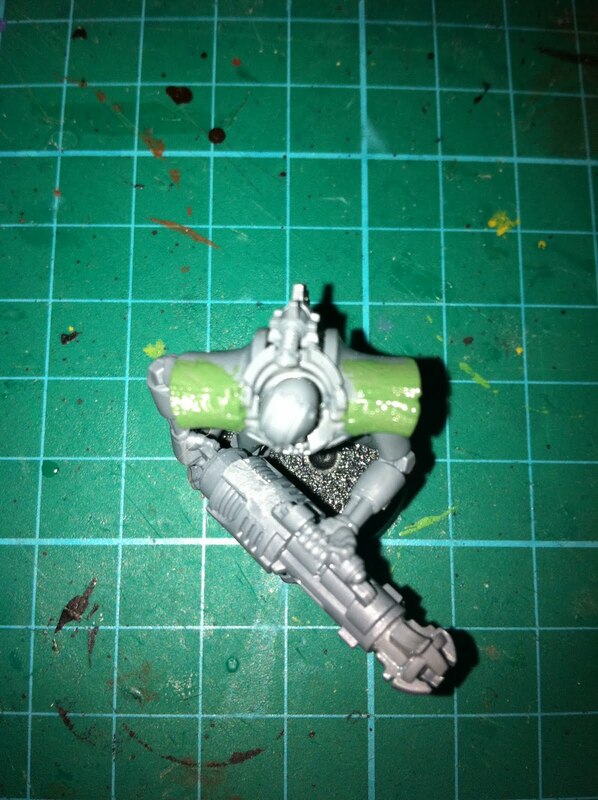 Lesson number 1 : If you attack a Necron Unit.. KILL IT DEAD! Lesson Number 2: Don’t split up your Tyranids! Focus fire, support each other, and overwhelm the enemy! In the end this game was a draw, though potentially a losing draw from my perspective as I feel I was on the back foot and was finding the surviving Monolith (One lost to deep-strike) was proving to be a proper pain in the derriere! The annoying thing is that I knew Lesson 2 well beforehand, I just got carried away, a good learning experience though, and I think Necrons may turn out to be an incredibly tough opponent for many armies in the future. 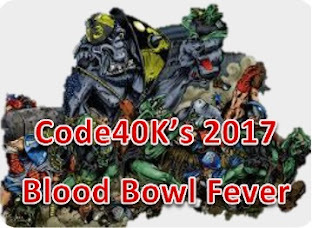 My Nids Vs Big Boss Bludtoof’s Orks, and he had 150 extra points! Finally, I got my first Fantasy game in as well! A Second game with Big Boss Bludtoof, this time Fantasy! 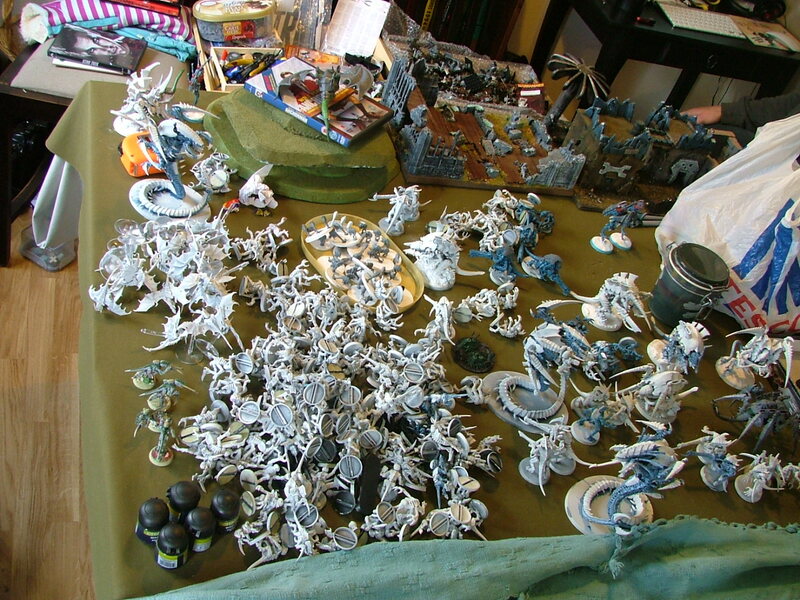 I used most of my Beastmen COlleciton for this, which involved some Minotaurs, a Great Bray Shaman, 2 other Bray Shaman’s, a borrowed Gorebull, and then a block each of Ungor, Gor and Bestigor. There’s nothing much else left to say here really apart from what a lot of fun, I think I love Beastmen, their magic, and their almost complete lack of Armour, and I’m going to enjoy getting all those other Fantasy games in over the course of the Next 11 Months! Finally, and as a Last aside, I also picked up a book the month Called "Ready Player One" by Ernest Cline. 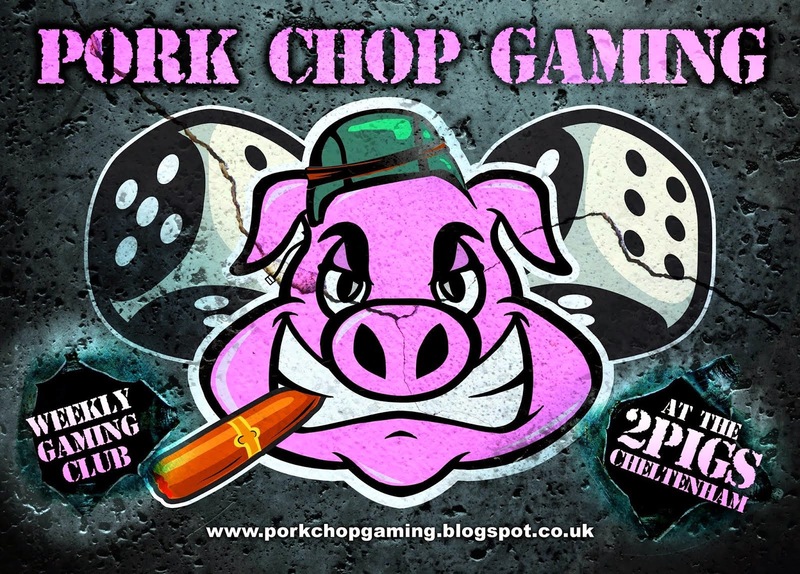 and Finally, a Teaser of some things to come! ...and I've got to be done by Mid-March you say!? 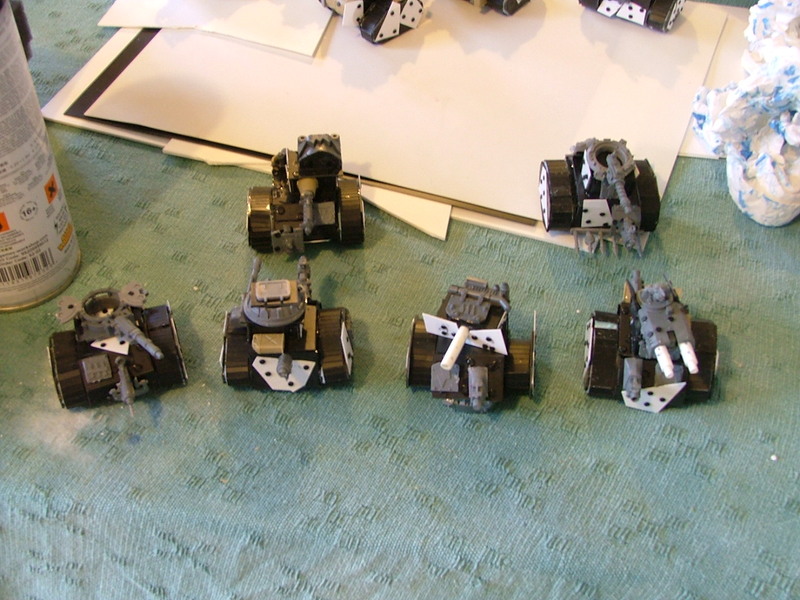 But here we have a group of 12 Grot Tanks, hand crafted by Yours Truly. 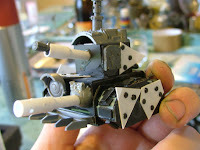 Now, For anyone wanting to build Grot tanks, and look for a Good Tutorial, I can highly recommend Kanvass' tutorial on Youtube. The guy has crazy skills and if you follow his tute, you'll end up with some beuatiful looking models. If you do it my way, you will probably end up some rather haphazard things (which I'm very proud of) which all do indeed look very different and hopefully are also fun to build. To go into a bit of background on these (and I wouldn't recommend anyone follow the methodology behind my construction of these past the initial groundwork!) 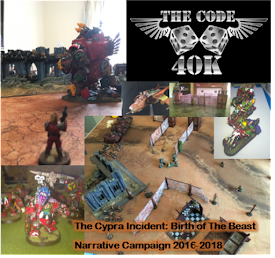 Last November, The Code Gang had a big apocalypse game. Beakies Vs Orks in the Return of the Battle for Big Toof. As is (apparently!) tradition, The Orks always need new, and bigger, and crazier toys. ...which is how I came to find myself in my tracksuit bottoms, at 5am, finishing the construction of the last tank, the day we were due to play... and I hadn't done the rivets. and this is an explanation of how I made them! 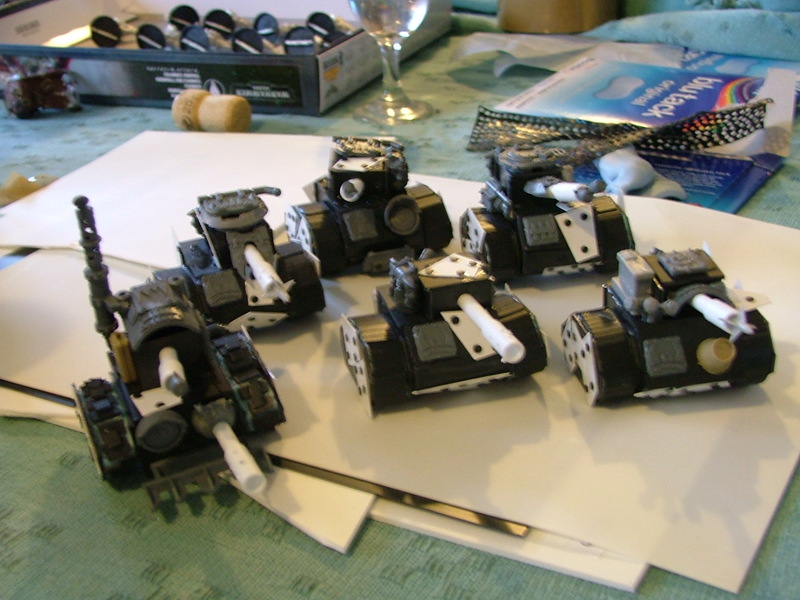 Every tank's basic shape is constructed in a roughly identical fashion. One track is made of the following. then as you can hopefully see from the pictures, I've angled each tread to hopefully mak it look a bit more tank like, this is absolutely to personal taste. Here do what you want, just make sure that each set of 2 treads per tank are the same! so, for one tank, you will need double the above. PVA two pieces of matching plasticard to one piece of matching blue foam and let set. Then PVA the entire facing of the blue foam that is showing in 'the sandwich' and wrap you scored thin plasticard tread around (bending it it around the angled treads in the places it needs to), using the overhang and some polycement to stick the tread to itself. If you angle it, be aware that you will need to shorten one of your front/back sections accordingly, and cut a new angled frnt/back section to match. Polycement these all together to make your boxy tank body shape. 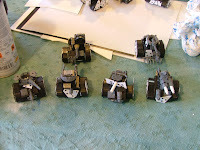 Then take your 2 x treads, and polycement them to the body of the tank. you now have your basic shape. alternatively you can use a hemisphere to make your turret... the key is that you do something a little different somewhere on the tanks! to make them look a little less like homogenous boxes, I also used a lot of plasticard extra plating, and cannibalised lots of unused Killa Kan/Truck/Orky parts to individualise each tank. Rivets are also key. To be honest, I think I went a little overboard on the Fighta Bomma... (coming next!) However, where Ork Vehicles are concerned, rivets are what takes it from a scratchbuilt piece, with very flat panelling (and looking a bit simple) to something that could conceivably have been cobbled together by some crazy Mek! 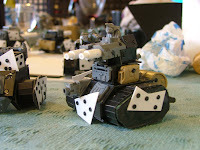 So later on this week, I will show you how Gruber's finest Little tanks look with a bit o'red paint on them (I think it's made a huge difference) as well as a certain Butchered up Italieri kit and some more rivets morphed into a Fighta Bomma! Red Mist here for his first blog outing. As you know were all building up to SVAXII and I'm busy painting transports for my beloved Catachan 7th Imperial Guard Army (Dutch's Desperadoes). 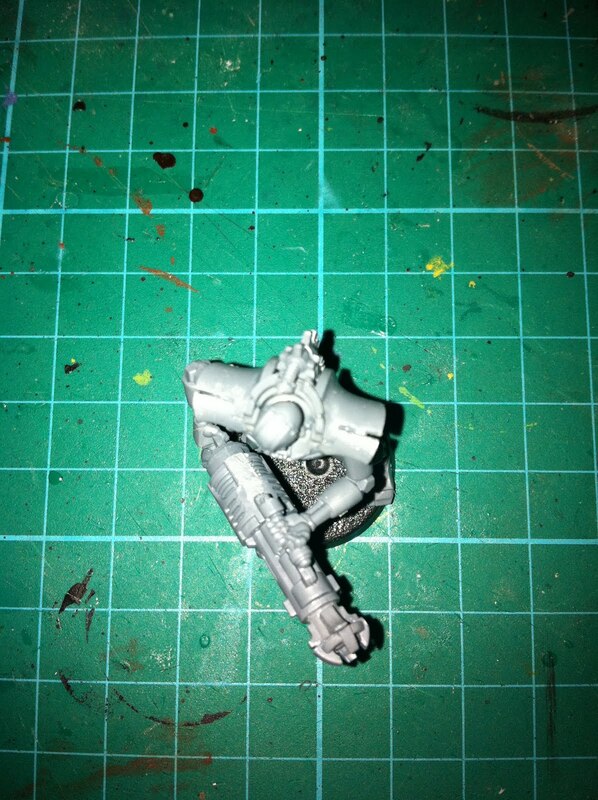 The men are all done bar one and I'm now on to Chimeras for my vets, IG never leave home without them. Attached are some WIP so far, got 3 do do in total. 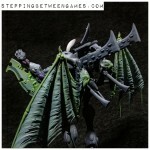 Have just finished a manticore and a converted Hydra, will upload some pics of these soon. What you might not know is that I also collect a Necron army, DOC and myself decided to pool our armies and build them up together so we can get all the options covered as well as saving us both some cash (times are hard after all), so I've just started work on Imotek the Stormlord (my first Finecast Model) will they stand up to the riggers of playing, I don't know, as them seem very delicate. To start with the rod weapon of his was bent to buggery... as well as being bent left to right it as also bent front to back. I made the mistake of showing my wife this and before I knew it she had snapped it clean in two, word of warning finecasts and wifes don't go. Any way after an hour of glueing, swearing and twisting in hot water I managed to fix it as best I could and here he is ready to paint, oh and the valve of my black spray can broke off when I opened it, joyous. With SVA XII and Carnage looming close I'm getting a few new bits and bobs together for my 5 new lists I'll need for them. 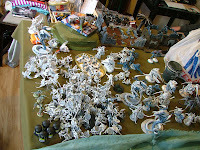 Sounds a lot but as my Orks are my most prevalent painted stuff I've got the vast majority of what I need already done. As you can see I've used the Forgeworld Ork half trakk upgrade kit, not a bad price considering you get a full plastic trukk kit as well as all the resin trakks, wheels and engine. You're left with plenty of extra bits, specifically wheels and an engine with which to make another trukk!! Huzzah!! 2 trukks for about £35. 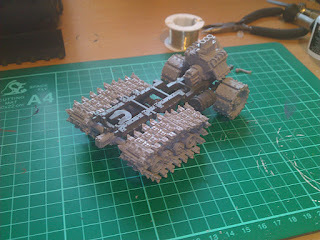 As long as you've got plenty of bits lying around, which any self respektin Mek should have or course! ...as with all resin..... FLASH! And plenty of it, especially around the trakk linkages, take your time and it comes off with a nice sharp craft knife to leave a really impressive mould, well impressed with the quality and Orkyness of the design. 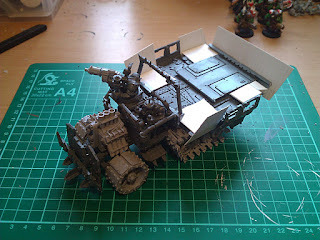 Not too tricky to assemble either but you have to remember it's Orky so it's meant to look uneven and wonky and once I'd done the chassis it looked good and was quite strong and rigid. 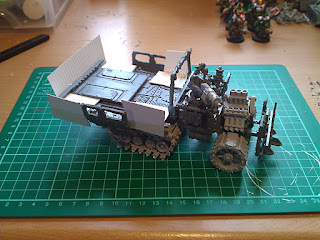 The engine blokk is made to connect to the drive shaft of the plastic kit as with the original however the resin gearstick was a pain to get in place so I ended up swapping it out for a scratch one. Don't try to use the original plastic one as it won't be in the right position and hits the front bulkhead of the cab section, stopping correct positioning of the cab. I also bought the Forgeworld Ork weapons set which is a fantastic assortment of Big Shootas, Skorchas and Rokkit Launchas; 11 weapons altogether with mountings and all unique too. So one of those went on in place of the original plastic one. All helps to create the desired impression of each vehicle in my Waaaghhh! being a unique creation of the competing Meks. So another year beckons, and this year I'm setting objectives which I will achieve!!!! Last year was a total washout on the objective front, with one thing and another. 5/ Start my First Fantasy army in over 20 years! This will be a Bretonnian army, and yes I know they're a bit weak in the new edition, in desperate need of a new army book but this will be a long term project and I'm unlikely to have a painted army this year so hopefuly by the time I'm ready to take to the field of honour the new book will be here. Most important to my decision to go with Bretonnians is that I can paint every knight as an individual, with his own unique colour scheme and styling. Only the plebs will need to be painted in uniform, which is good 'cos my downfall in the past has been that I get bored painting lots of identical models and thus my previous fantasy forays have ended prematurely with 1/2 painted units. I'm not gonna set a target number of models, just paint as much as I can and enjoy the experience. On that note I played my first game of Fantasy since the early 90's at the weekend and thoroughly enjoyed it! So Huzzah! Soon my glorious Knights will take to the field and smite all those who would turn a wicked eye to those lands under the protection and blessing of the lady of the lake. Have at you Cur!!!!!!!!! Hi All, Since last weeks post ive played 3 games with the crons and painted a Ghost Ark. Be warned a Ghost Ark is a difficult kit and required many sub assemblies and paint before be finally put together. I also had a little accident along the way where by i spilt an entire bottle of liquid poly over the 10 repairing necron warriors whilst they will still in pieces on my cutting board. After screaming at the top of my voice i managed to save all the components although some have lost some detail as the liquid poly melted them. So here is some pictures of the completed model some genuine feedback is always most appreciated and i will say i really took my time to get the finish you see here but would still like to improve it further if possible. 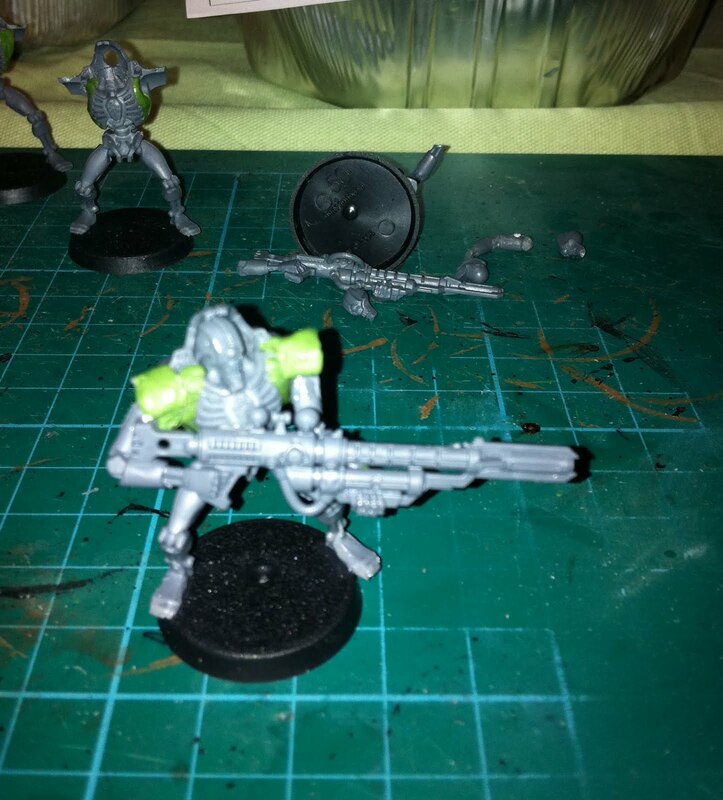 I also followed Luko Dakka's advice and applied gloss varnish to all the green necron power sources on the model this inluded the guns, orbs and engines. If anyone would like to know anything else about the model leave me a message? and i will endeavour to give a usefull response. Id also like to share with you mine and red mists basing strategy for the necron army which is snow and dead world theme. We are using a dead looking static grass and a snow paste. In addition i found some green crystals on www.wayland.co.uk called anarchy crystals. We felt these matched perfectly the power source green running through the army. So out came the pot of liquid green stuff and after talking to the GW guy earlier today i just applied it with an old brush in under two mintues.... The result is as follows.. So this picture was taken well the green stuff is still wet. All i have to say is how easy is that and when its dry i can either add some more or file it down... absolute genious product, well done GW. 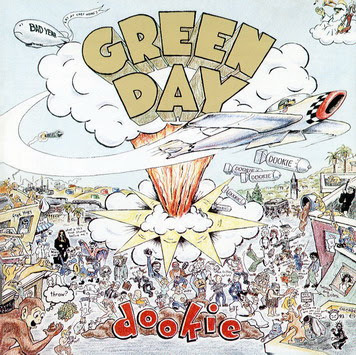 Ok so the post title mentions DOOKIE and for those who dont know its a green day album quite old now but pure punk rock and i love it! For me modelling is as much about the music as the modelling so dust of the old CD's and get them on. In my opinion you cant go far wrong with DOOKIE...... and to open a debate SHE is my favourite track but then they are all good. First time caller, long time listener. Thanks for the invite.